The Old Rus’ has left us its amazing white-stone monuments of architecture; the magnificent cathedrals of Vladimir and modest churches of the Moscow Region, constructed of white limestone, embodied their epoch with the stone handwriting of builders, whose talent in those remote times could reveal itself mostly in erecting constructions of cult. With amazing accuracy they abated soft limestone to make wall blocks, flagstones for footsteps, socles and bases, window cases, fanciful figures, ingenious ornaments and even statues. Intricate carvings of ornamental décor on ancient cathedrals have stood the test of time for many centuries. Usually the term ‘white stone’ stands for light carboniferous limestone (from the Paleozoic Era), occurring in the central regions of European part of modern Russia. However, it is also often referred to sandstone, dolomite, and Volga limestone of Permian formation, as well as numerous sorts of limestone, travertine, and alabaster lying in Transdniestria. Consequently, a more general definition of white stone is any treatable white-yellowish matt surfaced stone, which is neither marble nor shell rock. White stone was one of the basic building materials in Old Rus' and was of great historic importance as an expression of the state’s power and imperial ideology in the 12th -15th cc. It played a key role not only in the Old Russian Architecture, but in the history of the Old Russia as well. Christianity came to Russia from Byzantium, but church building was performed of plinthos (a special sort of broad and flat baked bricks) or in the mixed technology, «opus mixtum». The building methods used in Kiev, Novgorod, Pskov, Smolensk, and all other Old Russian lands, but for Vladimir and Suzdal Principality, where white stone building was started in 1152. In the pre-Mongolian years 95 per cent of buildings in Vladimir and Suzdal lands were built of white stone. The most emblematic and impressive white-stone churches are the Dormition Cathedral in Vladimir (1158—1160, rebuild in 1186—1189) and the Church of the Intercession of the Holy Virgin on the river Nerl near Bogolyubovo Village of the Vladimir Region (1158). In the 12th century, when white-stone building was launched in Russia, Byzantium was already weak and did not have any considerable power on the international arena. At the same time, in the epoch of Gothic and Romanic styles in the Western Europe building of various kinds of stone embodied the state power and imperial ideology, whereas brick was used only for minor secular constructions and churches in poor outlying districts. 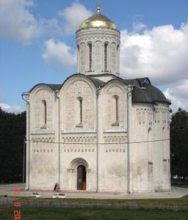 Hence, following the example of West European building, Suzdal princes shifted to white-stone technology, expensive and unreliable, but “imperial”. 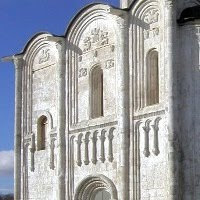 White-stone building became one of the major steps of the Old Rus becoming one of the leading European powers, the process, interrupted by the Mongol invasion for a long time. However, even in the hard times of the Mongol Yoke the builders of the Old Rus went on using white stone, which probably became one of the factors that helped the Vladimir-Suzdal Princedom in preserving its spiritual independence and resurrecting under the new name of Muscovy Rus’. When Moscow became the basis for uniting the disconnected Rus into a single state, the construction of monumental buildings was of great importance. Therefore, churches turned to be monuments marking crucial facts in Russian history. Thus, for example, the famous St. Basil Cathedral (1555—1560) was a celebration of Ivan the Terrible’s taking of the Kazan Khanate. In the late 15th century, when masters of the West European Renaissance completely shifted to the far more reliable, economical and practical brick building, the expression of the state power in stone had no sense any longer. Then Russians also switched to brick building. 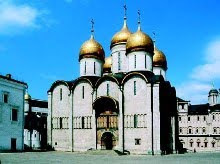 The last remarkable Old Russian white-stone church was the Dormition Cathedral (1475—1479) in Moscow. However, wide use of white stone did not stop, since it was used everywhere for bases, ground floors, and elements of architectural decor. Stone carving in Russian architecture reached enormous heights in the 16th- 17th centuries. White-stone carving was used both for church and secular buildings. Vivid examples of Russian stone carving art can be found in chambers and towers of the Moscow Kremlin. The Faceted Chamber (1487—1491) was decorated with intricate carved platbands in the 17th century, and the Teremnoy (Tower-Chamber) Palace is one of the treasures of Russian white-stone carving. The craftsmanship of Russian stone carvers manifested itself not only in Moscow, but in other towns and regions as well. Thus, carved stone details can be also seen in Yaroslavl churches of the 17th century, the Convent of the Presentation of the Mother of God in Solvychegodsk, etc. Fanciful carved ornaments and bas-reliefs are the greatest mystery of white-stone Old Russian architecture. It has come down to us only in fragments, mainly on the miraculously preserved St. Dmitrius Cathedral in Vladimir and St. George Cathedral in Yuriev-Polski. There are various hypotheses on the symbolic meaning of images depicted on the bas-reliefs of the St. Dmitrius Cathedral. Unfortunately, in the span of eight centuries that have passed since the creation of the church, Russian people somehow lost this beautiful legend, and so historians can only speculate about it now. Some explain the white-stone carving ornamentation as a peculiar expression of nostalgia that people of that time had about the heritage of paganism past recovery. There is also an option to account for these ornaments with the Roman, Byzantium, Scythian and Iranian, Celtic or Slavic pagan influence. Richest realm of animal and fabulous images settled not only on the walls of churches, but also penetrated inside, to the capitals. Most popular were the images of gryphons, lions and leopards. The lion and leopard symbolized the power and strength of Vladimir princes. Gradually they took place in heraldry of great princes. The image of the fanciful gryphon bore a triumphant, winning meaning. 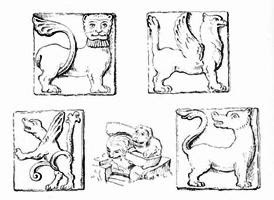 Along with these adopted motifs in white-stone sculpture there appeared folklore and apocryphal images, such as dragons, various birds, and Kitovras, which speaks of broad social content of white-stone sculpture images. Folk roots of sculpture most strongly manifested in the floral treelike ornaments.